The element of Fire speaks to fueling your passion. What are you bursting to do? Take if off the back burner – light a fire under your dreams to make them manifest. In your home, add FIRE energy to spark up your love life by bringing in sensual silks and satins to your bedroom. Use rich tones of orange and red for accent colors. Think round and full and lush. Pomegranates, plums and melons. Diffuse essential oils of ylang, ylang or jasmine in your bedroom and bath area. 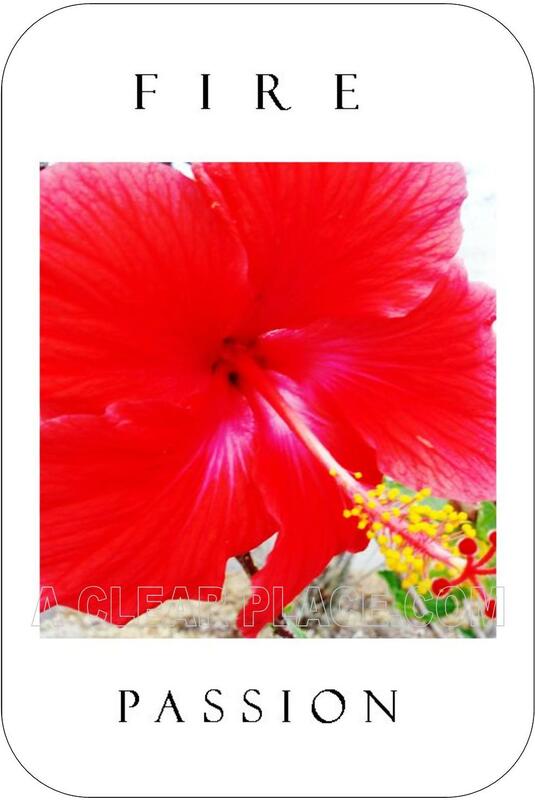 Incorporate images of fireworks, tropical flowers, the sun or jungle cats. FIRE energy can be added wherever you need a boost to get things done. Wear that red sweater when you are low on energy. A word of caution: as with any art; a little bit of red goes a long way. Try an accent pillow, rug or lamp vs. painting a whole room. The Element of FIRE corresponds to the season of Summer and the direction of the South. About this photo: I found this brilliant red hibiscus bursting out over a sidewalk in Maitlin, FL. It couldn’t be contained in the yard and was spreading its glorious self beyond borders. The perfect image for FIRE! Learn more about the Elements and how to add their energy to your space. Purchase your WISDOM CARDS. Love life need a lift? Got the romance blahs? Get a magical makeover for your bedroom and clear the way for love. Find out why your bedroom is the most important room in your home for manifesting your desires and taking care of your health. Get some tips!